Personally, I couldn’t care less for football, but I know plenty of people who enjoy it a great deal. Plus, it’s more of that social history thing that I love. 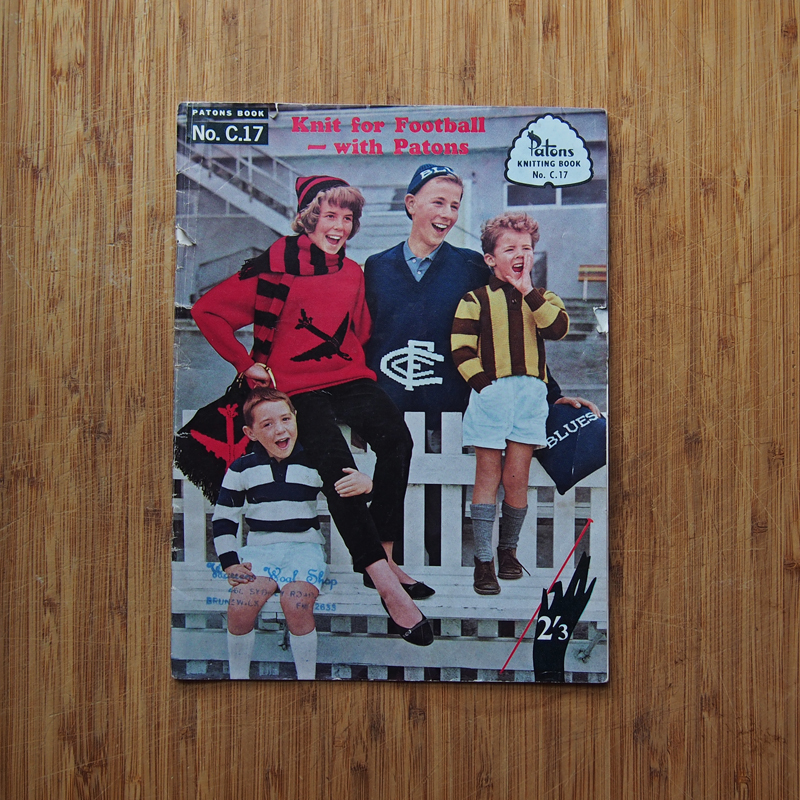 It’s so much fun to imagine how many jumpers, scarves and cushions (yes, cushions) were made from this book; how many kids went to school wearing team jumpers their mum or grandma had made. We know someone definitely received a North Melbourne jumper, thanks to the notes on the page below. 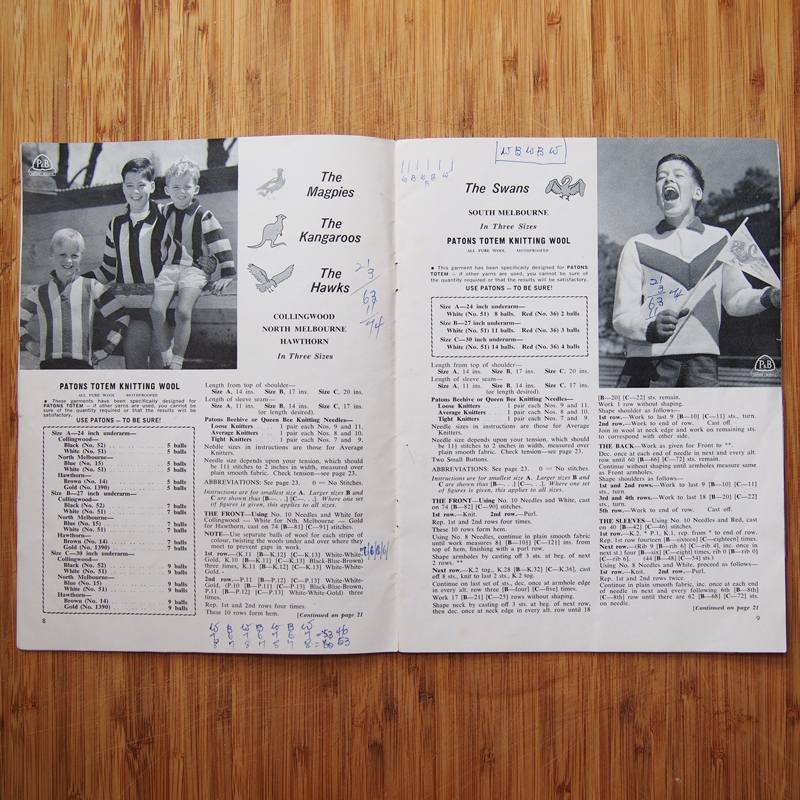 Football fans, please note the page on the right, featuring the South Melbourne Swans, not the Sydney Swans we know today. The book includes pattern grids for all of the logos of the time. Don’t you just love the old Saints’ logo? A stick-figure man with a halo. That’s sophistication for you! The best pattern is towards the end. 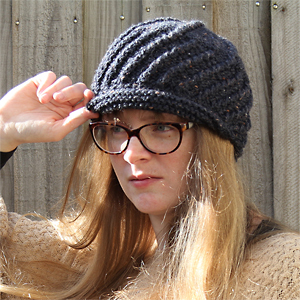 Part-beanie, part-scarf – we have christened it the hat scarf. I’m told by people who actually go to the football in the middle of Winter that this would be an amazing addition to any football-goer’s wardrobe. More to the point, I already have two requests for the hat scarf. But really, who wouldn’t want one? As much as I enjoyed this glimpse back our football supporting past and the vital role played by home knitters, it wasn’t actually my favourite find of the week. That came yesterday, when I wandered into the Bayswater Vinnies and made my way to the crafy section. 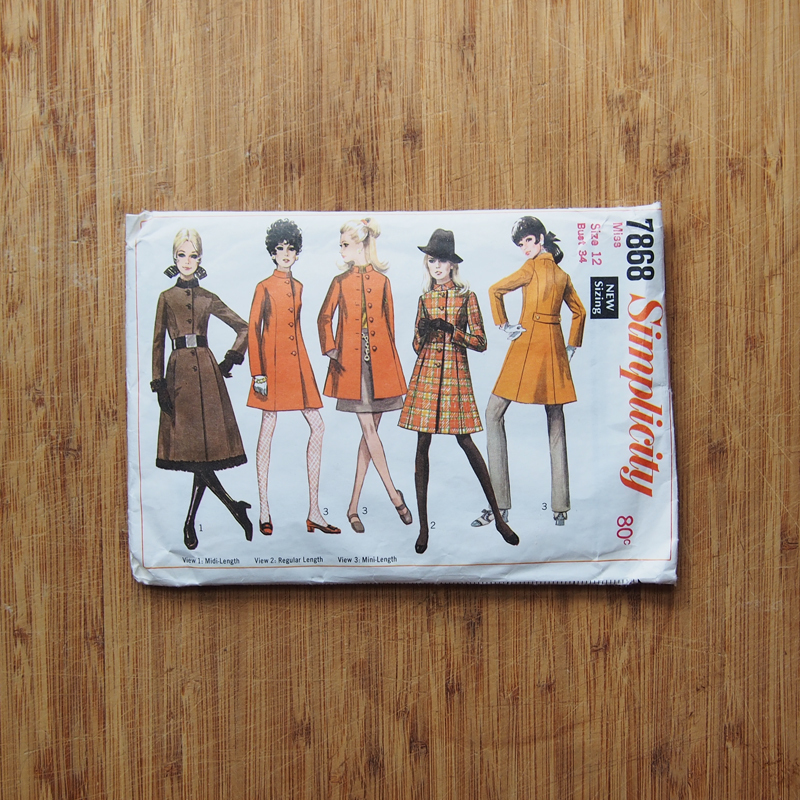 This treasure was just sitting there at the front of the box of patterns, miraculously overlooked by anyone else. A glorious coat pattern from 1968! How wonderful are the illustrations? It’s entirely possible I would have bought it for those alone. If the stick legs weren’t ridiculous enough, then just take a look at the hat on the girl with the checked coat. What on earth is going on with that? Ridiculous hat-wearing aside, I have plans to make this coat because it is too adorable for words. It would be fantastic if I could find the material for it in an op shop, too, but I’ll settle for using a pattern that cost me a grand total of fifty cents. This is what makes op shops amazing in my view: something that cost you next to nothing is valued more highly than things you bought brand new. I think I may be addicted to that feeling. More great finds! The girl with the hat thinks she is an international spy. You better watch out for her! Yes, she clearly thought the hat would help her to blend in. Little did she know it was going to do exactly the opposite. This is one of the things I love about the older pattern illustrations: it’s so much fun to make up stories to explain the odd looks and strange additions. I have envy. My local favourite carries heaps of knitting patterns but bugger all sewing patterns, and not that much fabric. Weeeell. A little bit. We have such an abundance of op shops in my local area – it’s absolutely wonderful! And of course, the first order of business in any new place I visit is to find the op shops. You have the most amazing Op Shop Luck/Karma/Talent! And now, I’m all kinds of curious about the knitting. Your vintage knitting pattern display reminds me that I just went through a whole bunch of my grandmother’s patterns this weekend. Photos must be shared. Isn’t it marvellous? I couldn’t believe it was sitting out in front and no-one had taken it yet. It was meant to be! I had to be a little mysterious about the knitting because there was an off-chance my dad might read about it and discover he was receiving a pair of socks for his birthday. They’re from an old pattern, of course. Socks haven’t changed that much, but I still love a classic pattern. Please do share photos of your grandmother’s knitting patterns! I absolutely love to see old treasures like that. What a cute coat, you were lucky to find such a great pattern! I’ve been checking every op shop I’ve walked pastfor sewing patterns and haven’t been able to find anything vaguely wearable (I’m talking mens and boys high waisted stubbies in two lengths). That sounds absolutely tragic. I must admit, a lot of the gems I find are hidden amongst a lot of shapeless eighties dresses and horrendous children’s patterns. Keep looking, though! You’ll find something eventually. Worth framing almost, that pattern cover! The woman in the hat looks like she is modelled after Emma Peel from the 60’s tv show “The Avengers”. 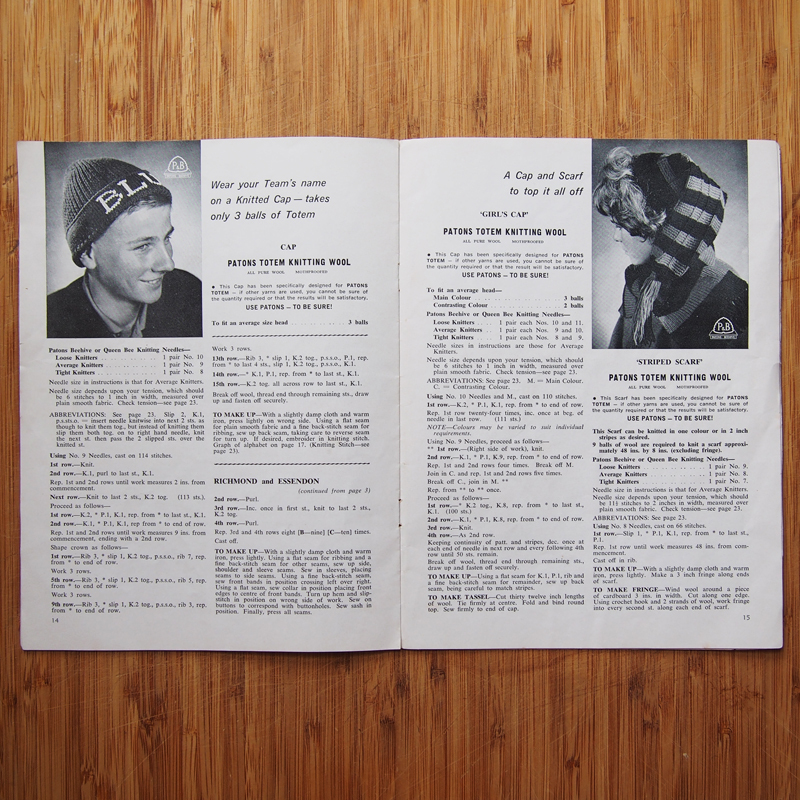 The footy knitting book is an absolute gem! We are heading over your side of town sometime in the next few days, might have to see if I can sneak in a quick trip to an op shop or two in Boronia! Emma Peel is one of my style icons! Now that you mention it, I could totally see her rocking that checked coat as she hopped in her Lotus and headed off to kick some serious backside. Try Bayswater for op shops – there are five in very close proximity!